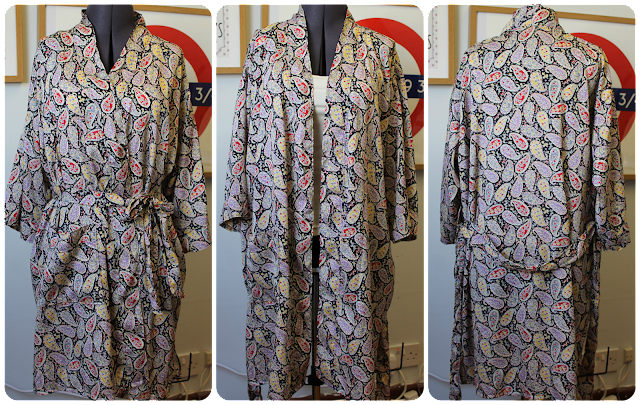 I have something a bit different to show you today, which is the Gather Buchanan Dressing Gown. I really needed a new dressing gown, as the one I had had most definately seen better days. A few holes in the seams had been fixed along with the hem, and also the ties to hold the fronts together on the inside. 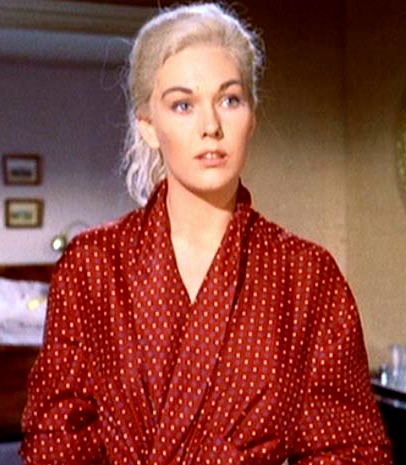 It looked a bit like this one that Kim Novak wears in Vertigo, except it was dark blue with white polka dots. My fabric is some viscose from Textile Express, it was only £5 per metre, so I ordered three metres. I think I used about 2 metres, and am hoping to be able to squeeze a sleeveless blouse out of the rest of it. It's quite lightweight, and perfect for a summer dressing gown. It's very fluid though, so I stablised it with some spray starch that I washed out once it was finished. My top tip is to peg it on the washing line well out of the reach of paws. As certain Mr Luke Spookling thought it would be a great game to start playing with the belt! Don't be fooled by that wee face. The only time Luke behaves is when he's sleeping! This pattern is lovely. Firstly, I ordered it one lunchtime, and got it in the post the next day; and secondly, the instructions are brilliant. The pattern suggests using a contrast fabric for the neckband, cuffs and belt, but I used the same fabric for everything. I made View 1 in the smallest size, and it comes to just below my knees, but that's because I'm small. The only mod I made was to the raise the pocket by 6 cms, as it was too low for me, and the way this pocket is constructed is very pleasing. All the seams are french seams, which was very time consuming, but look lovely and were worth it for this fabric. Also, I ended up top stitching all the edges and the joined seams on the cuffs, pocket and neck band for no other reason than I thought it looked nice. I also added ties to the inside as on my old dressing gown. As this fabric is so slippery, I felt it needed them, but they probably wouldn't be necessary on something like a cotton lawn. I made them in the same way and width as the belt loops and hanging loop, and cut them 24 inches long. The one on the side seam is level with the belt loops, and I eyeballed the one on the front, but really should have measured it up from the bottom as it is a bit high! It was attached to the inside front before attaching the neck band. Here are the inside ties in action - in case you're wondering what I'm talking about! I wearing this with my sweetheart neckline dress as I photographed it at the same time. This is one of those things that I didn't realise I didn't until I made it, because I've been wearing all the time - like right now. That's always pleasing! Oh man, I love that fabric! And how can one not love a good dressing gown? I have one in thai silk, and while I love the fabric, it is impossible to wear and has a stupid shape. Need a new one :) Thanks for recommending the pattern! Thank you! Thai silk sounds gorgeous, any chance of turning it into something else?! This pattern is brilliant, you won't be disappointed. I have never thought about making a dressing gown until now - this is lovely. I think it looks better without the contrast facing. Thank you! This was a "needs must" make for me, and the fabric just said dressing gown. It's lovely! I have been tempted after watching GBSB and now I've got the book and there's a pattern in there I'm even more tempted. I like your idea of same fabric for collar and cuffs. It looks great as a cover up/lightweight coat btw. Thank you! I thought one of the dressing gowns on The Bee was similar to this pattern, and it could definately be hacked into a kimono cover up. A lovely gown. Clever idea to add the inside ties - I didn't on my version and often wish I had! Thank you! I knew I would regret not making the inside ties, and your Buchanan was one that I found when I googled the pattern! I love the fabric, it's perfect for a dressing gown! I think Luke and Flo have similar hobbies!! Thank you! Yeah, I dread to think what would happen if that pair got together!! You are so clever; it looks really good. Thank you! I love how it turned out. Thank you! This fabric is just gorgeous.